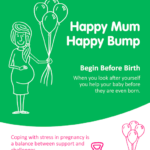 In Infant Mental Health Awareness Week (12-16 June 2017), our specialist midwife, Rachel Wild is spreading the Happy Mum, Happy Bump – Begin before Birth message, and that it’s okay to ask for support to help cope when things get a little too much. I’m a midwife and parent education teacher. I’ve worked with families from all sorts of backgrounds and most of them experience some sort of stress in pregnancy. So, the first thing that I want to say is that a little stress is normal and worries in pregnancy are really common. Dealing with short periods of stress in pregnancy can actually be helpful in getting you ready for when the baby arrives. Midwives call this ‘transition to parenthood’ and we know it’s an amazing, exciting time, but also a time when people can need a bit more help. When health workers talk about stress, we don’t just mean feeling anxious or miserable. Healthy stress is when we have a challenge to meet, our heart races and we worry, but we come up with a plan and feel better. When we are pregnant our baby experiences our stress, feels our adrenaline, and they get a little stress too, but this is a normal part of being a human and part of healthy baby development. Babies also feel the calm times too, and the happy times. As a midwife, I try and look out for when the amount of stress a family is experiencing becomes too much for them to deal with in this healthy way. Perhaps they have money worries, perhaps they are a long way from family support, or perhaps the mum or dad had bad experiences when they were little and now bad memories come flooding back. I know all the families I care for are different, we each have a personal level of ability to cope with difficulty. This is called our ‘resilience’ and it can change throughout our lifetime. When we have ongoing stress for a long time, or a sudden traumatic experience, it can mean our level of stress becomes too much for us to bear on our own. When we are expecting a baby this type of stress can affect them too, and can lead to physical and emotional health problems for them later in life. I know this can sound really frightening, but what’s really important is that getting help works and protects your baby. It is not always possible to reduce the amount of stress in your life, but it is usually possible to become more resilient. Research shows that just planning to get help and facing your worries protects your emotional health. Your midwife or health visitor can be a good person to help you think things through. Another great source of help is your local children’s centreall parents can get involved with their local children’s centre for free. One of the most profound thing that works is good relationships and connections. Humans cope better when they have help and support from people they love, and people they trust. This might mean help from a partner, family, and friends. It might mean joining a parents group or it might mean help and support from a specialist project or your GP. Being a mum or a dad is not something you have to do all alone. 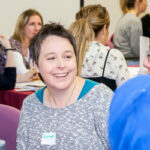 Midwives call good connections ‘social support’ and we know it matters a great deal when you have a baby. Not everyone has a good relationship with a partner or helpful family nearby. Remember, getting support for yourself also helps your baby. When you are loved and supported your baby learns to feel love and support too. Welcome to the World – A friendly, locally-provided antenatal course for pregnant mums, dads and carers. Bradford Doulas – Offering practical and emotional support to pregnant mums six weeks before the birth, during labour and six weeks after the birth, through trained volunteers. ESOL+ for pregnancy – Language courses for pregnant women with English needs, to help them engage with their midwife and be more in control of their pregnancy and labour. 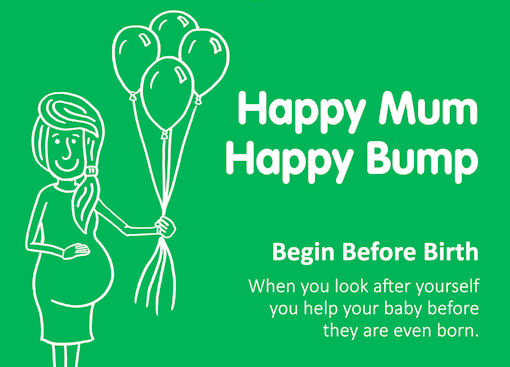 Baby Buddy App – Free mobile phone app for parents and parents-to-be, with personalised content approved by doctors and midwives, from pregnancy to six months after birth. Perinatal Support Service – Providing emotional support to families where a parent is struggling with their emotional health or wellbeing during pregnancy and the first year after birth.